Sample four of the finest, hand selected, small batch gins from across England. With a resurgence in gin distilleries and small-batch producers, there’s never been a better time to be a gin lover. 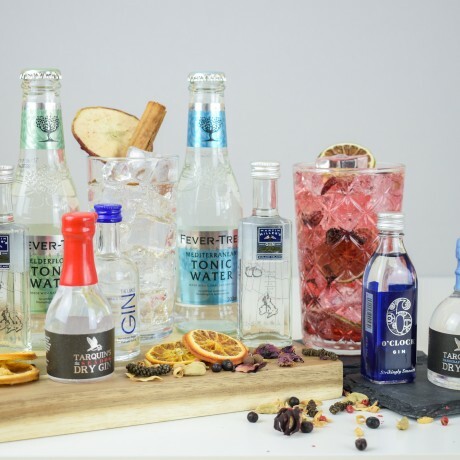 The English Gin and Tonic set features four miniature bottles of premium English Gin. The must-have gift for any gin lover, you can enjoy up to eight G&T’s per box. An English Gin and Tonic Set is the perfect way to explore and enjoy modern and classic gins, alongside premium tonic waters. Perfect for weddings, birthdays, celebrations, congratulations and thank yous. Bought as a present. Recipient was very happy. Lovely set, nicely packaged and great value. Excellent service. Would recommend to a friend. Perfectly presented, quick delivery, would highly recommend. Presentation was great, perfect for a gift. Presentation was great, perfect for a gift. Arrived earlier than expected. Overall very happy. Quick delivery. Lovely presentation box. The receiver of the gift was very pleased. Looks great but thought the glass was included. Looks great but thought the glass was included. I wouldn't have ordered if it wasn't! My wife absolutely loved her box! Described by Buzzfeed as 'Brilliant...essentially a far more practical recipe book'. At Tipple Box, we know cocktails.